You are a soul that has been sent to hell. While the reason is unknown, you are sure of one thing: you need to escape! It isn't long before you find the Red Queen who encourages and assists your escape. Maintaining a tunnel vision focus, you accept any help you can get and do whatever you have to as long as you can find a way out of hell. Starting out in a vessel that can't do anything more than move around and jump, you dive right in to the creepy atmosphere. A few paces in and you will be facing your first cryptic message telling you what to do. This is the first of many times where you will be tasked with a hide-and-seek style problem that you have to figure out. You can use an astral guidance system that when used it floats where you need to go. These are limited, but can be filled back up. I didn't end up using this system a lot because it wasn't too helpful. Most the times I used it, the guidance just led me to the locked doors and not in the direction I needed to go in order to get them unlocked. The save spots are interesting as it is both simple and gory. You will find a window like section on a wall with a head on the center and hands all around the rim. By interacting with it, this becomes your new checkpoint and the head is pulled in only to have multiple limbs thrown back out. This can be used up to three times, but it isn't your only option when you die. A death in the game will trigger what I call the Soul system. Basically you are nothing more than a soul at this point and need a new vessel. Taking too long or getting caught by a Soul eater will cause actual death. There are usually various options around, but you can guarantee a vessel by removing the bag on the heads of a few different NPC's you pass. You can also voluntarily leave your body in order to possess another that is an unreachable distance away or to simply take over a stronger vessel such as a Demon. Possessing a Demon is by far the best moments of the game. Instead of it being a defenseless horror, the game becomes action packed. You now have the ability to fight and slaughter those in your path! The combat and vision is completely based on which Demon you possess. Common demon possession will let you use telepathic powers to control and crush your enemies while brutish demons have slower, but much more powerful physical attacks. While you are playing with a vessel that is defenseless, you will mostly be sneaking around the enemies as you try to find the items you need to continue. There are little fire pits every so often that have a torch you can grab and occasional small cubby holes for you to hide in when caught. This is the shining section of the review. 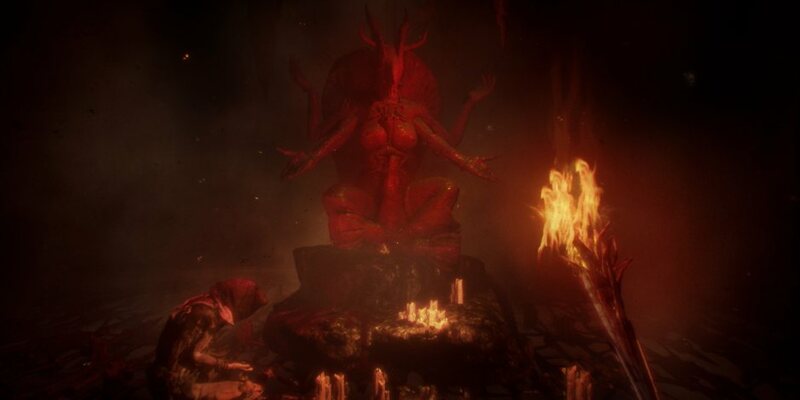 Agony is by far the most disturbing yet beautifully made games out there. While many games have created small interprets of hell before, nothing comes close to the accurate depiction created by Madmind Studios. I'm still curious just how much different the game would be completely uncensored. With the graphics being the most fascinating part of the game, I would definitely give this another playthrough with an unrated version. The sound effects matched everything going on and I don't feel that any of it was exaggerated. The music was always a nice touch as well. Soft in calm areas and built up in accordance to the level of excitement going on for each moment of the game, but always able to make me feel uneasy with my surroundings. There are plenty of reasons to play through the game again. Despite the fact that there are 7 different endings to unlock, there is unique content to check out in the "New Game+" mode. There are plenty of hidden items and secrets to uncover as well, which you would have to go through in order to unlock all the different endings. The very first thing that needs mentioning here is the AI. There were multiple times that I would catch the demon walking into a wall or getting stuck on a small hill. The worst notable moment is when I was chased back to a room that has a hiding place next to a fire pit. Even though the demon wasn't far, it didn't see me hide and when it tried to return to its usually pace, it got stuck in the fire pit. Once it finally managed to get past the fire pits glitch, it walked right over the fire and then died. All while I was forced to watch from the hiding spot it got stuck next to. This issue kills the games immersion which is worse than usual because it is the enemy itself ruining the game. Next up is the lack of a tutorial. While this would be fine for a game with basic mechanics, there is the unique Soul mechanic that needed explaining. I had no idea what was going on the first time I died, got stuck when I first came across the purple marking spots and started getting creative to switch vessels before figuring out what to do, and I don't understand why dying from falling doesn't get the same treatment as any other death, but instead acts as a instant death. I understood later that you can remove bags from certain NPC's heads and later possess them when you die so you can continue without going back to the last check point. To be fair, I did start the game on Normal instead of Easy, but i don't feel like tutorial should of been removed from the other difficulty. The story itself was a bit of a let down. I don't want to spoil anything, but I felt it was pretty generic and without twists. With a disturbing setting, unsettling sounds, creepy atmosphere, and an abundance of opportunity, I feel the story was bland. This particular issue may have been caused by my expectations being raised from the hype, but I still believe it to be a fair complaint. Finally, I have to say that the NPC's that surround the various sections of the game are annoying after the first couple times. They didn't provide enough lines for these characters and so you end up hearing the same thing over and over again. There should of been more variety here. I can understand a couple of them repeating the same thing again and again, but not every single one of them. We don't usually have this section, but I just have to say that I can't help but feel that Agony had so much potential and an amazing concept. Sure, I thought the story was a bit generic, but most of the issues that I found in the game could of easily been avoided. I think the reason they went unnoticed was due to all the distractions the team was facing as they neared launch. They had to battle with the ratings team to make sure their game could even be published, then they put a lot of focus into trying to give the least censored version to their audience, and while they continued to struggle under the legal pursuits of people who don't even intend to own this game they weren't able to focus on perfecting the game itself. It would of been better for them to push the release date out so that they could present the game in the best condition possible. This, I think, is the reason that the game ended up with so many flaws. The game has its moments where it is enjoyable and it has moments that are frustrating. The AI of the demons is poorly done and can break the immersion of the game. It is obvious that they put a lot more time into the graphical aspect of Agony than any other part of the game. It would of been more fun to have known how to play the game rather than guessing and with a smart AI that was as intimidating as its kills. With a few updates this game could easily be a great game, but as it currently stands, it simply doesn't meet expectations.